CHICAGO (AP) — The maroon and gold Final Four banner hanging from the rafters gave Nevada just a little extra motivation. Not that the Wolf Pack really needed it. 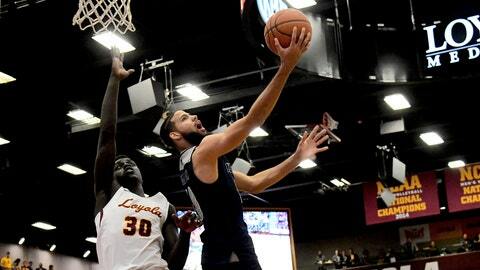 Loyola edged Nevada by one point in the South Regional semifinals last season — the only other meeting between these programs. That victory came during a stunning Final Four run for the Ramblers. Loyola great Jerry Harkness presented a Final Four ring to Sister Jean Dolores Schmidt — the now 99-year-old nun and team chaplain who charmed the nation during last season’s run — prior to the game. But with a raucous crowd packing the arena, Nevada did its best to put this one away in the early going. They led 29-9 midway through the first half after a layup by Cody Martin. He also hit a 3 with 5:22 left to make it 38-18 before Loyola cut it to 12 in the closing minutes. The Ramblers’ Clayton Custer missed a 3 that would have made it a nine-point game. Caleb Martin hit a runner and Porter scored on a layup to get it back up to 16 with 14 seconds left in the half. Loyola: Though they have three starters back, the Ramblers are already halfway to last season’s loss total. “For all of us, it stung last year but we were rooting for Loyola after they beat us and wanted them to win the whole thing.” — Nevada coach Eric Musselman. “I think it’s about getting better. I keep thinking about Coach Majerus. There were so many games where Coach Majerus talked about how you want to move your team along to get to where you need your team to be in January and February. Coach didn’t put so much into these early games. … We just saw where we want to go.” — Moser, an assistant on Rick Majerus’ staff at Saint Louis before taking the Loyola job in 2011.